Melt the butter in a large nonstick skillet over medium heat; add Granny Smith apples and cook for 10 minutes, stirring frequently. Stir in Fuji apples and cook for 5 minutes. Remove pan from heat and cool for 10 minutes. Stir brown sugar, lemon juice, lemon zest, cinnamon, ginger, nutmeg, clove and allspice into apples, until well combined; pour into pie crust. In a medium-sized mixing bowl, stir together oats, flour, granulated sugar, baking powder and salt, until well combined. Knead butter into mixture, using fingertips, until combined and clumpy. Place mixture evenly over the top of apples. Sprinkle with cinnamon. Bake pie at 375 degrees F, for 1 hour, or until golden brown. 34 comments on "Crumb Topped Apple Pie"
Hmmmm, nope. Not sick of pie yet. I love me some pie. You can send me this one, if you don't want it. It looks wicked good. Emmm...yum! You probably know by now that I love to bake but sometimes I am lazy. The only shortcut I like to take with the apples to cut them thinnly so that they do cook all the way through. I love the crumb topped idea. Looks amazing as always! So are you an Auntie or an Aunt? I'm digging the crumb topping on this pie. Thanks for pushing through these posts. Oooh. Looks scrumptious. I could never be sick of pie--love it! So, on a totally unrelated note...I was watching FN the other day, and in a promo for The Ultimate Recipe Showdown, I could have sworn I saw you! 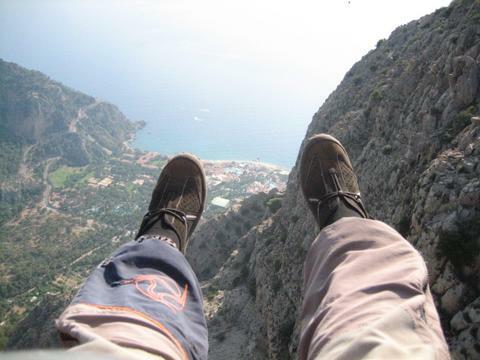 And then, I moseyed on over the the FN website and saw your profile. Congratulations! So THAT's why you went to NYC! Can't wait to see the episode!! Beautiful pie! Crumb toppings are really good. I've never had a problem with the cookage of apples in pies, but I've always thought the process of pre-cooking the apples to be interesting. I did it once for turnovers and it came out great, so I should do it with an actual pie once. I'm guessing it keeps a gap from occurring? Something that Im sure Emiline, never, never I would tired of apple Pie, I love it!! always and this look so yummy. I'm definitely a fan of the crumb topping on an apple pie. Actually, any pie!! I not tired of your pie posts ! 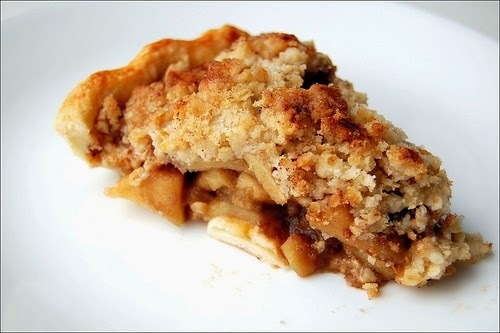 Apple Crumb pie is my all time favorite pie, I love crumb topping, on everything!! Your nephew is adorable! I bet he'd look younger if he shaved that goatee. The crumb topping is perfect. Your nephew is too cute :)! I could NEVER be sick of pie - especially YOUR tantalizing pies, Em!! Another beautiful pie -- you do pie so well. Your nephew is just the cutest thing. He will think you are famous the first time he sees the Wizard of Oz and hears 'Auntie Em' Auntie Em! Okay, NOW you're talking! I LOVE apple pie and REALLY love apple pie with crumble topping!!!!! Yummy! Who can be sick of pie? The crumb topping is a wonderful texture. Your nephew is a cutie pie Em! Pack up your unwanted, orphaned pies and send them to me...I will luv them, cherish them - eat them! sick of pie?! Thats not possible! In England, we make a similar dish but without the pie crust. It's called apple crumble, and served with lashings of custard sauce it's one of my favorite desserts. I have two nephews of my own, now 6 and 4, know exactly what you mean. Goatee/ Not a bad idea!! I don't think precooking your apples is what makes the difference. I think it's your fabulous combination of spices and enough sugar to make it really good. That fabulous crumb topping doesn't hurt either. Bob, I like John Mayer. Val, that's a good idea. Hi Happy Tummy. I can't believe you were able to identify me in that commercial. I'm only on there for a second. I will blog about the experience in the future. I have to get permission first. Christina, yes. It does prevent that awful gap. Sharon, I don't want him to shave the goatee; I think it suits him. Liz, he is pretty great. Peter G, he is a cutie pie. Peter M, I'm shipping yer pie right now. Heather, I like apples in savory food. Like a sandwich with cheese. Lori, they sound like a handful! What a beautiful pie! Apple pie is something we never tire of. oh gosh. you crack me up. All I needed was a slice of cheddar cheese to place on top. Nah, just kidding. I never put cheese on my apple pie. I know a few of you that do. You weirdos. you just totally made my sunday. Gorgeous pie!!! And I couldn't agree more about crumb top -- soooo yummy, especially with vanilla ice cream melting into it. YUM!!! Dutch apple pie is my favorite way of an apple pie. I like a slice of extra sharp cheddar on top. What is it with toddlers? They're like squishy little destructo-bots. Love the goatee on the nephew!! Yeah - what's up with cheddar cheese? I agree - crumble tops are the way to go. Precooking the apples is an interesting tip. I'll have to star this recipe and give it a try. Yum, this sounds so wonderful. I'll have to try it when I get my new pans. Thanks for sharing this. love the pie even more. 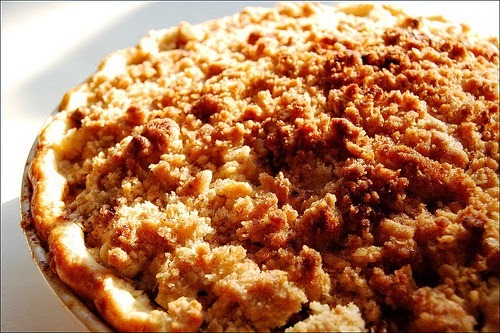 if anything could ever top a double-crusted apple pie, it's a crumb-topped apple pie. Checked out your list of favourites - it's so much fun seeing what other people are loving! Can you believe I still haven't seen Garden State? But I love Eternal Sunshine... and The Science of Sleep. :D Write more of your favourite things soon, okay? Happy New Year! I love apple pie and I am always looking for a better recipe. I notice that you use Granny Smiths and Fuji apples. These are hard, crisp apples and do not cook down very well. I use the golden delicious or being from Michigan a Macintosh apple. These apples cook down well and tender. Plus with the golden delicious you don't have to use a lot of sugar, because they are a sweet apple. Try one or both of these apples, I think you will like the taste and results.